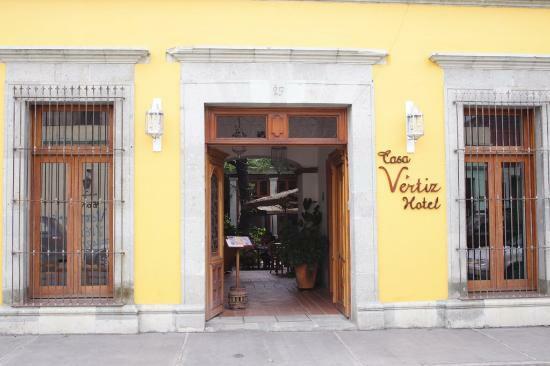 Casa Vertiz is an old and renovated colonial house located behind Santo Domingos church-4 blocks away from the Zocalo. Here we will make you feel like home. Casa Vertiz has rooms with special decoration with a coffee touch and atmosphere. The relaxation in the terrace has a view to the cupula of Santo Domingos church. The restaurant-Las Nubes-is located in a small garden in where the nature combines its beauty with the architecture of the construction. Coffee is the main subject of our decor, we even have a coffee store where coffee is toasted and ground then sold. With an excellent location in downtown, close to many interesting places. You can expect individualized attention during your stay in this beautiful city. Additional information: Children under the age of 8 stay free in the room with parents and in existing bedding. Children age 8-11 receive a 10-pct reduction.